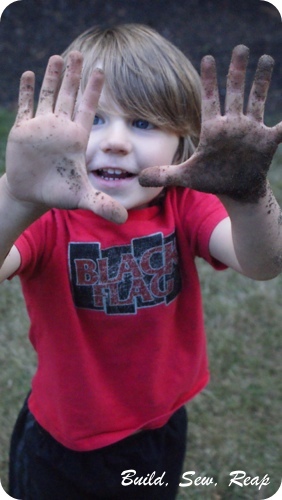 If you've been following the blog at all this summer, you know we've been renovating our side yard very very slowly. We'd love to do it quickly but the kids and other commitments keep that from happening so it's a slow process. At some point along the line, I got my hands on a bunch of granite scraps for free and decided to make a path using them. The person who gave us the scraps also gave us some fine sand. Well, the fine sand didn't hold the pieces in place so I ripped it all up and used the kind of sand they recommend for stone walkways. [heavy sigh] It turns out that wasn't good enough either so I ripped up the path a.g.a.i.n. What does this story have to do with the title of this post? Well, what's a gal to do with the load of purchased sand she can't return? Make a sandbox of course! 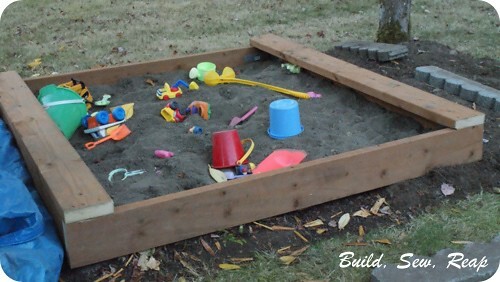 The Snickerdoodle had all his beach toys unloaded in my pile of sand on the tarp on the driveway anyway so we used some scrap wood left from the raised beds and cranked him out a sand box in the back yard. This was a really quick and easy project. I just cut 4 pieces of the cedar 2x6 to 5 feet and screwed them together. 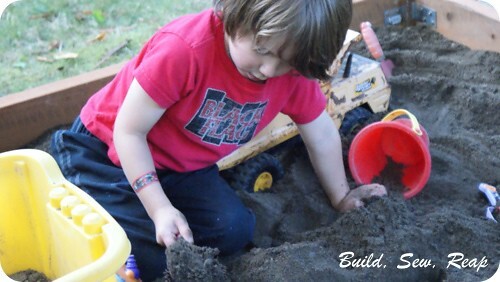 We dug a bit of a ditch in the place where it is so that the sand is actually deeper than it appears and there's still room for all his toys within the frame. We put some landscape mesh at the bottom then put the frame in place. Next we stapled two layers of thick plastic to the inside of the frame so the bottom of the sand box is protected from bugs, roots and weeds (to a certain extent, I'm sure it's not perfect). Finally, we loaded in the sand and the toys.